To save you the trouble of picking up one of these books without the other, I've gone ahead and merged Connie Willis' hefty Blackout and All Clear into a single 1132 page tome (which is also the way I read it). Look at how seamlessly the books fit together! Wikipedia actually calls it "two volumes that comprise a [single] novel" and that's the truth. It was meant to be a single book but then, as Willis says in the Acknowledgements at the beginning of each book, "it morphed from one book into two". What she ended up creating, regardless of length or format, was an amazing story that was entirely engaging from beginning to end. It got me through a snowstorm that kept us trapped on our property for an entire week and I definitely have to thank Connie for that! Continuing with the world that Willis explored previously in the short story Fire Watch and the novels The Doomsday Book and To Say Nothing of the Dog, this is the tale of time-traveling historians Merope, Michael and Polly from Oxford in the year 2060, who independently head to WWII England and become a much larger part of the war effort than they ever imagined they would and certainly more than they thought possible under the rules of time travel. Skipping between narratives, including a couple told by initially unknown persons, this is a complex web that keeps the reader thinking, guessing and, ultimately, hoping and praying. In 2011, this dyptych won the Nebula award for Best Novel, the Locus award for Best Science Fiction Novel and the Hugo for Best Novel. And it's not a mere matter of luck that she also was nominated for (and usually won) these same awards for the previous two novels set in this future of time travel and historical interest. The level of depth that she plumbs to make the world tangible and believable is nothing short of amazing. I frequently felt that I too had been transported to another time while reading. I found myself sitting in a packed tube station, waiting out a night of bombing during the Blitz. I looked into the burning mess of ships that was Dunkirk in May of 1940. And I held my breath as incendiary devices fell on St. Paul's Cathedral and threatened to set the wooden roof timbers ablaze. I'm still not entirely sure that Connie Willis isn't a time traveler who experienced these events firsthand! And, lest this sounds like too gushy of a review, I had one small complaint -- that this story was split into two books. I am a reader who frequently goes back to look things up that I read previously and it was difficult when I couldn't remember if the passage I was thinking of was earlier in All Clear or all the way back in Blackout. Yeah, that's my complaint. Not really a deal-breaker, is it? 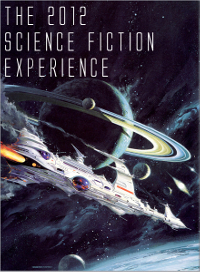 You still have time (until the end of February) to pick something up for the 2012 Science Fiction Experience. If you aren't sure where to start with the Oxford series, Connie's blog has an Oxford Time Travel Guide. 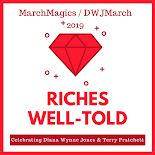 It even has links to read or listen to the short story Fire Watch, which I will be doing soon. I just don't want to get through everything too quickly because I love this world and don't know if she will write another story in it. That said, I fully anticipate reading Fire Watch and The Doomsday Book before the end of the year. Finally, congratulations are in order as Connie Willis was also just named a Grand Master of Science Fiction in January. And, as these books are just a drop in the bucket of her collected works, can anyone suggest what I should read of hers next after I finish these books? I did enjoy these but didn't know that Blackout ended in the middle like that!! It should be more clear that this is one giant book split into two. I loved how she chose to end it too. Oh, this would be such a great book for a snowstorm! New York hasn't had a good one yet (and now I feel like it's not going to happen), so I haven't done any snowstorm reading this season. Alas. I really want to read these books. I am thinking I might have to buy them before the end of the year. These two do sound good - and I've been meaning to read 'To Say Nothing of the Dog' for a while. I will probably still make that the first book by Willis I read. But I think you've converted me! I must read these...I must! Jenners - That would have totally thrown me for a loop if it happened to me. I was lucky to have waited and been able to read them together! Tracy - To Say Nothing of the Dog is a much lighter, sillier book (and shorter!) so I agree that you should read it first. It's absolutely brilliant.